Sitting down to write an article that clearly delineates and defines Beyond Baroque Literary/Arts Center of Venice, California, feels as daunting an exercise as trying to catch a cloud. Just as when, in The Sound of Music, young upstart novice Maria joins the convent and the establishment nuns size up the dreamer in their midst, singing, "How do you solve a problem like Maria? How do you catch a cloud and pin it down?" After all, over the organization's forty-year history, it has worn many hats: cutting-edge avant-garde literary 'zine, presenter of art nouveau, gallery, happening-space, recital room, publishing imprint, nurturer of young talent and, perhaps, above all, dreamer-of-all-that-art-can-be. It's a furiously moving, ever-evolving entity. Thus, appropriately, Beyond Baroque Literary Arts Center has boldly branded their upcoming relaunch event, "2010: A Beyond Baroque Odyssey." Like Beyond Baroque itself, this evocative title could mean many things to many people. Perhaps, to more clearly grasp the beast in question, we had better look inside Beyond Baroque itself. During a given month within its walls, a visitor could witness an extraordinarily wide array of events. One Sunday evening, you might watch a staged reading of The Local Snake Tour, a play inspired by a poet's close encounter with a rattlesnake on her living room floor. In the play, the author speaks to the snake—and the snake speaks back. Or one Friday, you could be treated to the strange sounds of SSOTTL and Brain Garden, as they produce "aural expressions of language cognitions where sound materials do not repeat" and "cerebral dance music." Or you could hear the politically charged poetry of returning Vietnam veterans, Japanese internment camp residents, and opponents of Big Oil. You could meet writers expert on such diverse topics as Johnny Cash and Zen Buddhism, and then celebrate Halloween with a reading of poems written in the apartment where Bela Lugosi died—and top it all off with a Halloween cake! Or you could, simply, participate in the world-famous Wednesday Night Poetry Workshop that fostered the talents of poets, writers, actors, and musicians including Bob Flanagan, Viggo Mortensen, and Exene Cervenka, to name a few. So what exactly is the (elusive) Beyond Baroque Literary/Arts Center, anyway? And where did it come from? In answer, George Drury Smith, writer and founder of Beyond Baroque, writes simply: "sometime in 1964, I conceived the name for a magazine—Beyond Baroque." Smith had come to Venice seeking the once-vital Beat scene. By that time, however, Venice West Café had closed, and the Beat scene had more or less died out. And so, according to poet/translator and new Executive Director Richard Modiano, George Drury Smith founded Beyond Baroque magazine "to try to recreate—no, not to recreate—to continue having a Beat scene in Venice." Once the articles and pieces had been selected, typing them up and printing them became an odyssey in and of itself. For instance, the Selectric typewriter on which they composed the 'zine had no memory, so "the user was required to type everything twice" in order for the machine to properly space lines. To achieve the vivid color printing necessary for the cover page, each page had to be run through four times for blue, yellow, magenta, and black colors. After the first color had been applied, the page had to be sprayed with a fine powder to prevent the ink from bleeding onto the following page. This happened after each color. And, once all of this was completed, all of the 30,000 pages printed had to be collated…by hand. It was, indeed, a labor of love. Beyond Baroque was finally completed and published in December 1968, and reviews lauded the magazine. It did not, however, prove to be the instantaneous commercial success of which the founders had dreamed. Undeterred, George Drury Smith and his small staff redoubled the efforts they threw into the next edition. In addition, Beyond Baroque began to grow in its capabilities, its mission. As long-time former Executive/Artistic Director Fred Dewey put it, "people responded to [the magazine], they decided that they needed a space to meet." In response to these demands, in the fall of 1969, Beyond Baroque opened up a space near Abbot Kinney Blvd. ; there, they began holding poetry readings and musical recitals. John Harris and Joseph Hansen moved their famous Venice Poetry Workshop into Beyond Baroque's humble West Washington Avenue storefront—the workshop has continued uninterrupted ever since—and with it came the Beat scene that George Drury Smith had sought. From there, to quote the Kansas City Star, Beyond Baroque was flying high, "zooming off to a rip-snorting start," holding Air Raid presentations on the last Friday of the month, dedicating a library of magazines and books from other small press publishers—an archive which would soon grow to become the "largest independent library of small press literary publications in the world"—and negotiating with the city of Los Angeles to move into the old Venice City Hall in 1969. And the rest, as they say, is history. 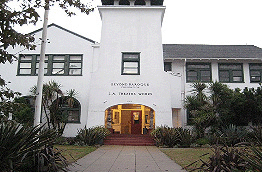 In keeping with its mission to "bring poetry and spoken word to the people," Beyond Baroque Literary/Arts Center blossomed into an incredible, vital literary resource to L.A., to California, and to the West in general. Beyond Baroque's reading series have brought such luminaries to Venice as Allen Ginsberg, Christopher Isherwood, Amiri Baraka, Wanda Coleman, and Patti Smith—among scores of others too numerous to name. Beyond Baroque Literary/Arts Center has assisted in creating permanent public art projects to honor L.A. poets around town, from the Poetry Walls on the Venice boardwalk to the lobby of the Junipero Serra State Office building downtown. Under the dedicated direction of former director Fred Dewey, Beyond Baroque launched its own imprint, publishing books as diverse as Oh, Tongue!, a book which highlights the conversation of a Florentine Jew with her dead father, and American Zen Bones, poet laureate of Venice Philomene Long's study of nearly one hundred koan-like moments in the life of celebrated Zen master Maezumi Roshi. Beyond Baroque has also continued to grow its library, which features chapbooks from various authors around the country and the globe. Finally, Beyond Baroque Literary/Arts Center has, as Odyssey organizer S.A. Griffin puts it, played host to important "parts of our L.A. history." For instance, the band X was formed when Exene Cervenka met John Doe one Wednesday Night Poetry Workshop. 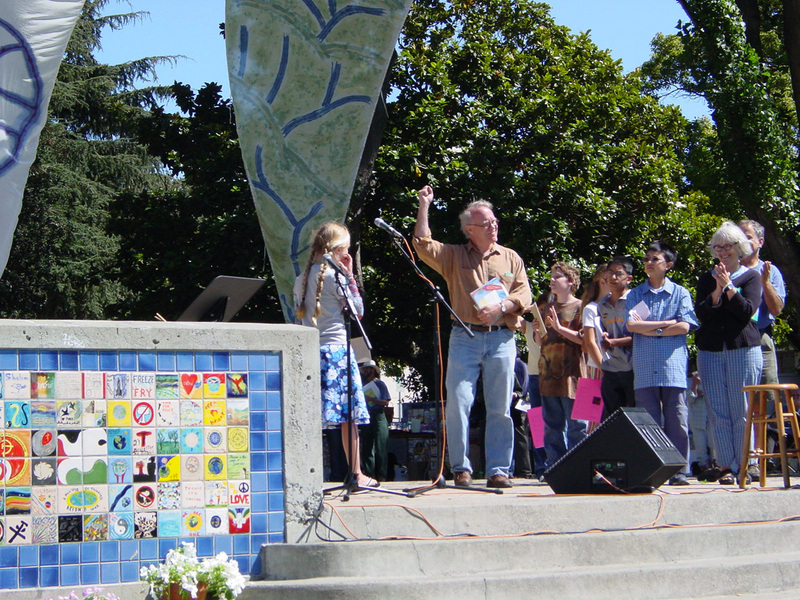 Also, the late and celebrated poet Bob Flanagan read at the Wednesday Night Workshops for years. When asked about watershed events at Beyond Baroque Literary Arts Center, Executive Director Richard Modiano cited the fifteen-hour marathon reading of On the Road, hosted in homage to the book's fiftieth anniversary in 2007. At the event, dozens of Kerouac enthusiasts and acquaintances took their turn reading a portion of the original scroll, to a jam-packed house. In fact, such was the enthusiasm for the event that "some people [who couldn't be there, but wanted to read] read their part by phone, and [Richard] put [his] cell phone up to the microphone" to broadcast their portion to the assembly. Today, as ever, Beyond Baroque Literary Arts Center remains a vital, ever-evolving hub of the literary arts, both for southern California and for the nation. Events occur every single night of the week, from the Monday Experimental Fiction Workshop to the Sunday Open Readings. What's more, Beyond Baroque hosts about ninety-eight readings and special events throughout the year. And, on November 6 and 7, Beyond Baroque will launch a new phase of its odyssey. To celebrate their entry into their fifth decade of service, as well as acknowledge their transition to a new director and even more community generated programming, Beyond Baroque Literary/Arts Center will host a weekend of celebration. Like Beyond Baroque itself, the weekend will kick off to a "rip-snorting start" with a marathon poetry reading, as almost one hundred-forty poets read from 10 a.m. to midnight. On the second day, the improv performance artists L.A. MudPeople and jazz ensemble The Scrappers will perform. Harking back to the "Space Odyssey" theme, just as in Kubrick's 1968 film 2001: A Space Odyssey, the L.A. MudPeople serve as a nod back to the past, the apes around the monolith. According to one "tribe member," the Mud People "don't speak. [They] move slowly, wear full-head masks with…mud." And they hang out and interact with their environment. The Scrappers, on the other hand, tend toward the futuristic with their improvisational jazz. After that, there will be a panel discussion with George Drury Smith, Richard Modiano, John Harris, poet/indie publisher Tosh Berman, poet Bill Mohr, actor/poet Harry Northup, and others. According to S.A. Griffin, "they'll talk about the past, and the present. Then we'll all talk about where we're going. It'll be a true community meeting, we'll set our priorities. We're all working to figure out Beyond Baroque's relevance in the present and future." The "2010: A Beyond Baroque Odyssey" weekend celebration will be entirely free, and open to the public. The event has been coordinated by S.A. Griffin, co-editor of The Outlaw Bible of American Poetry, known for the Poetry Bomb Project, and Rafael FJ Alvarado, The Moe Green Poetry Hour host of the World Wide Word Radio Network and Hollywood Institute of Poetics impresario, two poets with a wide-angle take on the diverse literary and art scenes of L.A.
And just where will the Odyssey take them? What is the future aim of Beyond Baroque? As Richard Modiano boldly puts it, "just about every poet of significance in the United States has read at Beyond Baroque, and we aim to keep it that way." Or, as 2001's Hal might say, "I am putting myself to the fullest possible use, which is all I think that any conscious entity can ever hope to do." 2010: A BEYOND BAROQUE ODYSSEY, November 6-7, 2010. 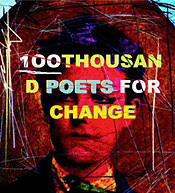 SATURDAY: Marathon Poetry Reading with 140 poets, 10:00 a.m.-midnight. SUNDAY: Performances by improvisational performance troupe The L.A. MudPeople and jazz ensemble The Scrappers, panel with founder George Drury Smith and Wednesday Night Workshop founder John Harris, performances noon-6:30, panel at 2:00. Beyond Baroque Literary/Arts Center, 681 Venice Blvd., Venice, (310) 822-3006, beyondbaroque.org.